The two discolored carbon block cartridges in the photo turned blood red with rust stains and clogged after only two months of service at a home served by a small municipal water supply in Texas. The cartridges are 4.5″ X 20″ carbon blocks that were installed in tandem, so that each got only half of the water flowing into the home. Use was moderate. 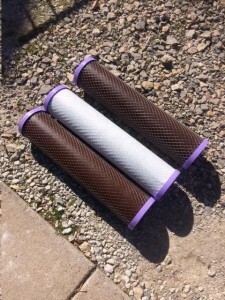 The condition of the filters underlines the lesson that we are learning from news from Flint, Michigan and the many other poor water quality stories that are surfacing involving city water systems. The lesson is that city water is not necessarily as safe as we have always assumed–that it isn’t, in fact, being monitored to assure that every drop that comes from the treatment plant is perfect and certainly that every drop that passes through our aging delivery pipes gets to us without contamination. The logical place to treat water to assure its excellence is at point of entry–where the water enters the home itself. Carbon filtration at point of entry and a high quality drinking water unit under the sink are becoming as common and as necessary as locks on the doors. Ultraviolet treatment, once used almost exclusively on unchlorinated wells, is now becoming a common fixture in city homes as “boil water” alerts and disinfection failures become more common. 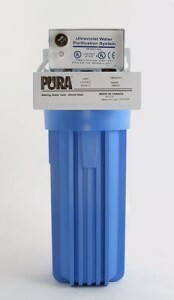 UV provides a margin of safety even where water is chlorinated.